For other uses, see Alder (disambiguation). The common name alder evolved from Old English alor, which in turn is derived from Proto-Germanic root aliso. :alder The generic name Alnus is the equivalent Latin name (which is also the source for Alamo, the Spanish term for the tree). Both the Latin and the Germanic words derive from the Proto-Indo-European root el-, meaning "red" or "brown", which is also a root for the English words elk and another tree: elm, a tree distantly related to the alders. With a few exceptions, alders are deciduous, and the leaves are alternate, simple, and serrated. 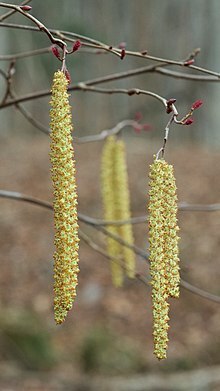 The flowers are catkins with elongate male catkins on the same plant as shorter female catkins, often before leaves appear; they are mainly wind-pollinated, but also visited by bees to a small extent. These trees differ from the birches (Betula, another genus in the family) in that the female catkins are woody and do not disintegrate at maturity, opening to release the seeds in a similar manner to many conifer cones. The largest species are red alder (A. rubra) on the west coast of North America, and black alder (A. glutinosa), native to most of Europe and widely introduced elsewhere, both reaching over 30 m. By contrast, the widespread Alnus viridis (green alder) is rarely more than a 5-m-tall shrub. Alders are commonly found near streams, rivers, and wetlands. In the Pacific Northwest of North America, the white alder (Alnus rhombifolia) unlike other northwest alders, has an affinity for warm, dry climates, where it grows along watercourses, such as along the lower Columbia River east of the Cascades and the Snake River, including Hells Canyon. Alder leaves and sometimes catkins are used as food by numerous butterflies and moths. A. glutinosa and A. viridis are classed as environmental weeds in New Zealand. Alder leaves and especially the roots are important to the ecosystem because they enrich the soil with nitrogen and other nutrients. Because of its abundance, red alder delivers large amounts of nitrogen to enrich forest soils. Red alder stands have been found to supply between 120 and 290 pounds of nitrogen per acre (130 to 320 kg per ha) annually to the soil. From Alaska to Oregon, Alnus viridis subsp. sinuata (A. sinuata, Sitka Alder or Slide Alder), characteristically pioneer fresh, gravelly sites at the foot of retreating glaciers. Studies show that Sitka alder, a more shrubby variety of alder, adds nitrogen to the soil at an average of 55 pounds per acre (60 per ha) per year, helping convert the sterile glacial terrain to soil capable of supporting a conifer forest. Alders are common among the first species to colonize disturbed areas from floods, windstorms, fires, landslides, etc. Alder groves themselves often serve as natural firebreaks since these broad-leaved trees are much less flammable than conifers. Their foliage and leaf litter does not carry a fire well, and their thin bark is sufficiently resistant to protect them from light surface fires. In addition, the light weight of alder seeds (650,000 per pound, or 1.5 million per kg) allows for easy dispersal by the wind. Although it outgrows coastal Douglas-fir for the first 25 years, it is very shade intolerant and seldom lives more than 100 years. Red alder is the Pacific Northwest's largest alder and the most plentiful and commercially important broad-leaved tree in the coastal Northwest. Groves of red alder 10 to 20 inches (25 to 50 cm) in diameter intermingle with young Douglas-fir forests west of the Cascades, attaining a maximum height of 100 to 110 feet (30 to 33 m) in about sixty years and then lose vigor as heart rot sets in. Alders largely help create conditions favorable for giant conifers that replace them. Alder roots are parasitized by northern groundcone. The catkins of some alder species have a degree of edibility, and may be rich in protein. Reported to have a bitter and unpleasant taste, they are more useful for survival purposes. The wood of certain alder species is often used to smoke various food items such as coffee, salmon and other seafood. Most of the pilings that form the foundation of Venice were made from alder trees. Alder bark contains the anti-inflammatory salicin, which is metabolized into salicylic acid in the body. Some Native American cultures use red alder bark (Alnus rubra) to treat poison oak, insect bites, and skin irritations. Blackfeet Indians have traditionally used an infusion made from the bark of red alder to treat lymphatic disorders and tuberculosis. Recent clinical studies have verified that red alder contains betulin and lupeol, compounds shown to be effective against a variety of tumors. The inner bark of the alder, as well as red osier dogwood, or chokecherry, is used by some Indigenous peoples of the Americas in smoking mixtures, known as kinnikinnick, to improve the taste of the bearberry leaf. 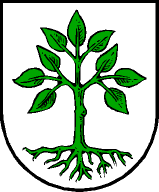 Alder is illustrated in the coat of arms for the Austrian town of Grossarl. Electric guitars, most notably those manufactured by the Fender Musical Instruments Corporation, have been built with alder bodies since the 1950s. Alder is appreciated for its claimed tight and even balanced tone, especially when compared to mahogany, and has been adopted by many electric guitar manufacturers. As a hardwood, alder is used in making furniture, cabinets, and other woodworking products. For example, in the television series Northern Exposure season 3 episode "Things Become Extinct" (1992), Native American Ira Wingfeather makes duck flutes out of alder tree branches while Ed Chigliak films. Alder bark and wood (like oak and sweet chestnut) contain tannin and are traditionally used to tan leather. A red dye can also be extracted from the outer bark, and a yellow dye from the inner bark. Alnus acuminata Kunth — Andean alder, aliso. Mexico, Central and South America. Alnus cordata (Loisel.) Duby — Italian alder. Italy, Corsica. Alnus cremastogyne Burkill — China. Alnus glutinosa (L.) Gaertn. — Black alder. Europe, Central Asia. Alnus jorullensis Kunth — Mexican alder. Mexico, Guatemala, Honduras. Alnus nepalensis D.Don — Nepalese alder. Himalayas, Tibet, Yunnan, Nepal, Bhutan, Myanmar, Thailand. Alnus rubra Bong. — Red alder. Alaska, Yukon, British Columbia, California, Oregon, Washington, Idaho, Montana. Alnus maritima (Marshall) Muhl. ex Nutt. — Seaside alder. United States (Georgia, Delaware, Maryland, Oklahoma). Alnus nitida (Spach) Endl. — Himalayan alder. Western Himalaya, Pakistan, India, Nepal. Alnus viridis (Chaix) DC. 1805) — Temperate and subarctic Europe, Asia, North America. ^ a b "World Checklist of Selected Plant Families: Royal Botanic Gardens, Kew". apps.kew.org. ^ Arno, Stephen; Hammerly, Ramona (2007). Northwest Trees: Identifying and Understanding the Region's Native Trees. Seattle, WA: Mountaineers Books. p. 165. ISBN 978-1-59485-041-7. ^ a b c "Online Etymology Dictionary". Retrieved 29 March 2019. ^ Clayson, Howell (May 2008). Consolidated list of environmental weeds in New Zealand. Wellington: Department of Conservation. ISBN 978-0-478-14412-3. ^ Arno, Stephen; Hammerly, Ramona (2007). Northwest Trees: Identifying and Understanding the Region's Native Trees. Seattle, WA: The Mountaineers Books. pp. 165–69. ISBN 978-1-59485-041-7. ^ "Plant Search Result". www.pfaf.org. ^ Nakasako, Eric. "A Look at Venice: Past and Present". Illumin. University of Southern California. Retrieved 22 January 2018. ^ Ewing, Susan (2012). The Great Alaska Nature Factbook: A Guide to the State's Remarkable Animals, Plants, and Natural Features (2nd ed.). Graphic Arts Books. pp. 106, 142. ISBN 978-0-88240-868-2. ^ Tilford, Gregory L. Edible and Medicinal Plants of the West. ISBN 0-87842-359-1. ^ Staff (2009). "Bearberry". Discovering Lewis and Clark. The Lewis and Clark Fort Mandan Foundation. ^ "Native Plant Dyes". United States Department of Agriculture Forest Service. Retrieved 17 December 2014. Chen, Zhiduan; Li, Jianhua (2004). "Phylogenetics and Biogeography of Alnus (Betulaceae) Inferred from Sequences of Nuclear Ribosomal DNA ITS Region". International Journal of Plant Sciences. 165 (2): 325–335. doi:10.1086/382795. 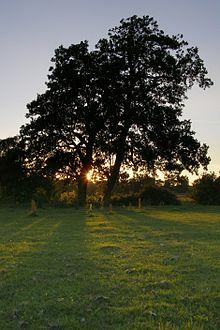 Wikimedia Commons has media related to Alnus.